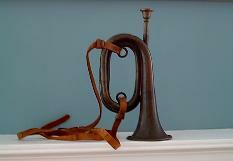 Okay, you have seen a bugle at an antique store or have come across one on an Internet auction site. There are many questions that come up: “What is it? Is it worth the price the seller is asking? Is it really a Civil War, Spanish-American War or World I or II instrument? What does the writing on the bell mean?” Up until recently, there has been little information published about bugles and few resources available. The following is meant to be a guide in identifying bugles commonly found at antique stores, sutlers (stores that cater to Revolutionary and Civil War re-enactors), and through Internet auction sites like eBay. 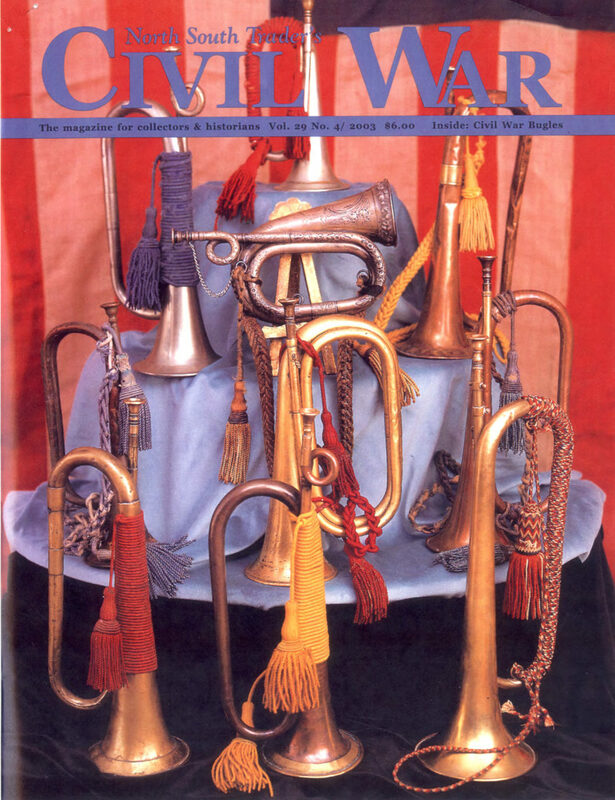 This is NOT a guide for every type of bugle or natural trumpet NOR a price guide, rather a reference for the identification of the most common types of bugles. This is also not meant to be the final word as you can find bugles in just about every variation of size and key. In many cases it is important to ask questions about something in which you are about to invest money. There are no hard and fast rules about metals used in construction, markings on the instruments, seam construction and size. You can always find an exception to the rule. If the following does not supply you with an answer, ask. The best thing to do is contact an experienced collector or historian. I am always happy to answer any question or will point you in the right direction should I fail to provide an adequate response. Chris Nelson is a foreign policy analyst in Washington, D.C., and a collector since 1958; a long-time member of the Northern Virginia Relic Hunters Association; a Contributing Editor, Military Images Magazine; a consultant to Time-Life Books “Arms & Equipment of the Civil War”; a talking head on “Civil War Journal”; and author of “Mapping The Civil War”, Fulcrum Publishing, 1992. Length 11 in., Bell diameter 4 in. This is a double twist bugle in B Flat that has been referred incorrectly to as a M1855, although the British call it a Duty Bugle. These bugles were introduced in England in 1855 or 1858 but the model they are based on can be traced back to 1810. This has been the regulation bugle for all British military services for over 150 years. One thing to say about the British – they certainly maintain tradition. Although the British have also used trumpets in E Flat, the bugle is the standard signaling horn. 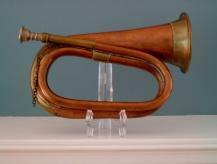 These instruments can be easily identified when compared to a cheaper made reproduction (see “Gunga Din” Bugle, below). The originals are made of a heavier gauge metal and many have British manufacturing markings such as Distin, Hawkes & Son, Potter & Co, Boosey & Hawkes and Besson. 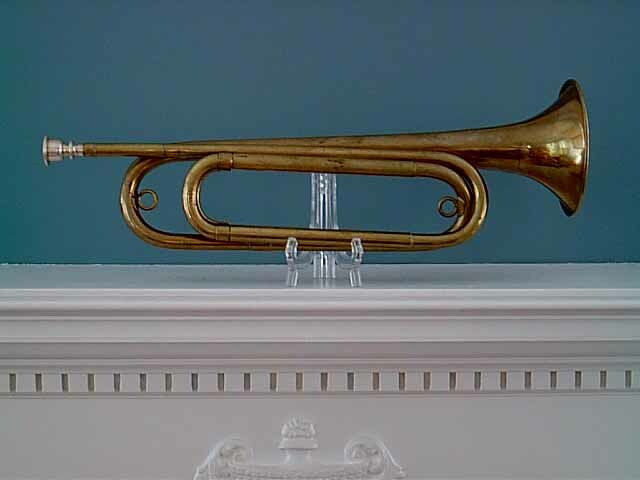 Since this type of instrument was around at the turn of the last century, many Civil War veterans acquired them for use at GAR reunions and as replacements for their lost original bugles. Unfortunately many of these M1855 bugles have survived as “Original Civil War” artifacts and have surfaced in museums and collections labeled as the genuine article. Because they may have been engraved with the veteran’s name and unit, it has been assumed that the instrument dated to the Civil War. This is not the case. There is no proof that the United States contracted for bugles from England and there is no photograph of a Civil War musician with one of these horns. A British Duty bugle found with markings identifying it to a Civil War veteran may be valued as an item belonging to someone who served in the war, but the instrument can not be regarded as a true item from the conflict. It should be viewed in the same way as any GAR or post-war uniforms and equipment. Named after the Rudyard Kipling poem and hero of the 1939 film in which a Hindu water boy yearns to become a British soldier and is given a bugle, these instruments are copies of the British M1855 Duty Bugle and are made in Pakistan and India. They are the typical type of horns that are found on many Internet auction sites and at relic shows, flea markets, antique stores and sutler shops. As mentioned above, these horns are made of cheaper and lighter metal than the original M1855 bugles. Many souvenir stores and Civil War sutlers sell them unmarked or with a US or CSA marking (usually surrounded by a wreath) and also with crossed sabers and a 7 and A. They can be purchased at these sutlers for under $50. On some you can also find the marking “Pakistan.” To be fair, most are sold as souvenirs and are not passed off as original Civil War horns. However, many Hollywood movies have used these instruments as US bugles and many Civil War re-enactors have used them at Civil War events (and some still do). Despite the efforts of informed buglers and brass historians to alert unwary and unsuspecting sellers and buyers to the background of these horns, the Gunga Dins, like the genuine M1855 bugles, still do show up labeled as “Original Civil War” horns. I remember a few years back when a seller in Washington attempted to auction a Gunga Din complete with the crossed sabers and the 7 and A on it. Despite my best efforts to provide the correct information on this horn, the seller insisted that it was appraised by a local music store for $1,500! Well, if someone wants to pay that amount, this is still a free country. If someone wants to purchase a Gunga Din as a wall hanger, go for it! Just remember, CAVEAT EMPTOR. Bell diameter 5 Â½ in. This is the most common type of bugle used during the American Civil War. It is a big-belled instrument that is in the key of C but can be lowered to B flat with the use of a crook. (A crook is usually a pig-tailed piece of tubing.) 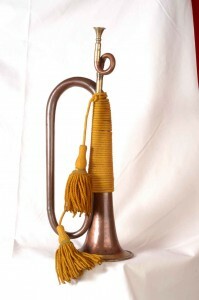 This is a single twist instrument made of copper with a brass garland or made entirely of brass. The clairon itself is of European origin although some American companies (Graves, Stratton and E.G. Wright for example) produced them under wartime contracts. During the Civil War many of these bugles were imported from Europe, mainly France and Prussia (Germany), and were stamped with the name of an importer (John Church, Horstman, Philadelphia) or contractor. 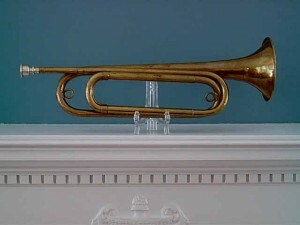 This type of bugle has remained in use in France and there are photos showing its use in the United States military, although it was not considered a “regulation” bugle. Many American companies continued to sell them into the 20th century as Infantry bugles. Because of its use, this style of bugle is quite common and from a distance any one of these instruments could pass as a Civil War horn. There are good modern reproductions made by Amati and Andrew Naumann, and hundreds of French-made (Coueson, Besson) instruments that are Civil War period correct. The Amati and French-made models are in the key of B flat (without the use of a crook) and can be found on Internet auction sites and at relic shows. Length 16-17 in., Bell diameter 4 Â½ in. This is the M1892 field trumpet (bugle), on which all modern bugles are based. They are marked “US Regulation” or with a manufacturer’s name. More information on these bugles can be found in The Origins of the M1892 Bugle elsewhere on this website. These horns are quite easy to find on Internet auction sites and are still manufactured by a company called Buglecraft (the company used to be called Rexcraft). The M1892 bugles are pitched in the key of G which is lower than the modern B flat trumpet, making it easier to sound all the notes. The problem is that most of these horns are of cheap construction and play rather poorly. Better ones were made by instrument companies like C.G. Conn, Wurlitzer, Holton, King, Buescher or Ludwig. Beware that, like the “Gunga Din” bugles, there are thousands of these instruments being made in Pakistan and India of very poor construction. These have no marking on them anywhere. The M1892 was used by the U.S. military, Boy and Girl Scouts, drum and bugle corps, fraternal and paramilitary organizations as the standard bugle for sounding calls. There were variations of this bugle which included a long single twist version (length 28 in.) designed in the 1930s for parade use. 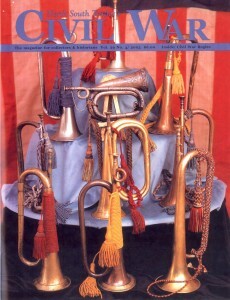 This style was known as a Fan-fare bugle or Legion Model bugle (made by Wurlitzler) due to its use in drum and bugle corps sponsored by the American Legion. Large baritone bugles pitched one octave below the standard M1892 bugle became popular in drum and bugle corps use, and a somewhat elongated version in an Art Deco style was also produced, as well as a plastic version manufactured during World War II. During the 1920s a bugle was designed with a single vertical piston (not unlike the Bersag horns of Italy) that enabled the horn to switch from the key of G to D. The piston was eventually moved to a horizontal position to hide it from adjudicators at drum and bugle corps competitions. Many bugles with the one valve (both horizontal and vertical) exist today. The move to valves on the regulation M1892 G bugle evolved as the modern drum and bugle corps grew from its roots in the American Legion to the organizations that exist today. Eventually two and then three valves on bugles (ranging from soprano to bass) would be allowed in competitions and there is a move today to allow the horns to be pitched in B flat. This is a far distance from the original M1892 field trumpets that were employed in drum and bugle corps following World War I.
Leather Strap approx. 50 in. This is the M1894 bugle in B flat, also referred to as a “Trench” bugle. These small triple twist bugles can be found on Internet auction sites and at antique or relic shows. They have no tuning slides and the pitch is not consistent between horns. Those manufactured for the military under the specification #1152 dated April 25th, 1912 are identified by the writing on the bell which marks the manufacturer, specification number (Spec. 1152), and date of production. The military versions were issued with a leather carrying strap and sometimes a wool cord with tassels. Military issues prior to 1912 have been found without markings like those manufactured for civilian use, and can be distinguished from subsequent issues by the thinness of the cord rings and the shiny brass finish. One point to clarify about these bugles; they were issued as infantry bugles but were also used by other branches including the cavalry. There is no record of the Army ever officially designating these little horns as “Trench Bugles,” as bugle use was restricted on the front lines during World War I for obvious reasons. There were many makers of these horns, including Wurlitzer, R&H, J.W. York and others, and at least one foreign maker. As much used as these small horns were during World War I, they were overshadowed by the more popular M1892 field trumpet. This entry was posted on Monday, May 31st, 2010 at 4:45 pm	and is filed under Bugles for Performing and Collecting. You can follow any responses to this entry through the RSS 2.0 feed. Responses are currently closed, but you can trackback from your own site.